Review: A couple with a newborn baby are forced to live next door to fraternity house. The couple do everything in their power to take them down. This film is just known in other countries as Neighbors. 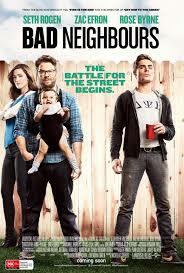 Apparently the reason why they called this Bad Neighbors in the U.K was because we all love the Australian t.v. series Neigbours too much and they were worried that people would get confused over this. Zac Efron held the whole film together. Not the best film that he has done. Not as funny as it should be. Too many rude jokes. Once or twice is enough but to carry on it starts to not be funny. All the good jokes and scenes ended up being shown in the trailer. I have read that Seth Rogen and Zac Efron took major pay cuts in order to help save money for the budget. The entire film was a waste of time and money.